My tween nephew was over for a week-long summer visit and veggies are not his favorite thing. Being a family of ovo-vegetarians (who lean vegan when it’s easy to cook, or opt-out) we eat a lot of veggies. Without some crafty seasoning the dear nephew might have starved! One of the recipes we made during his visit was Vegan Jambalaya, and he enjoyed it so much he asked to take some home with him. Luckily, it keeps well – in the refrigerator for a week, and in the freezer for a month. This recipe serves 8 -10. It’s a two-day recipe so I only make it twice a year, but it’s worth it. 1. Dice and mix the first 9 ingredients. 2. Cover with cling wrap and refrigerate over night. 1. Cook 1.5 cups rice with 3 cups water in the rice cooker. 2. Transfer the veg mix from day 1 to a large pot, add 1 cup broth (or water and bullion). Bring to a boil then simmer for 20 minutes, stir frequently. 3. When the rice is done, add rice and canned beans to the large pot. Mix well. Turn off heat. 4. Taste it. Add more seasoning as desired. Enjoy! 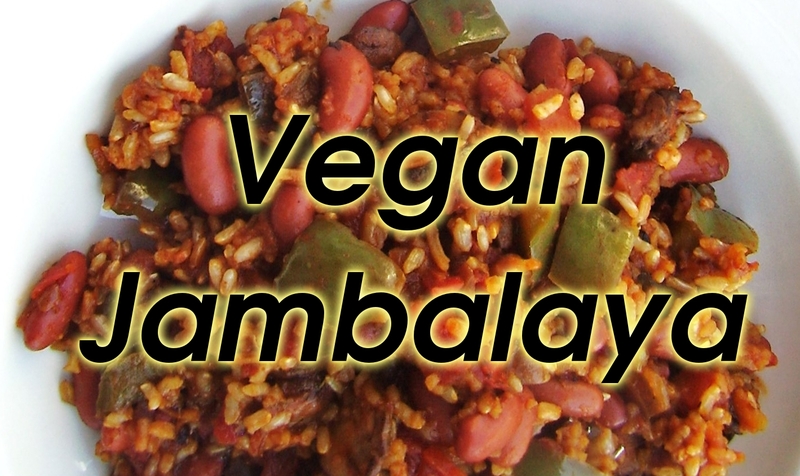 This entry was posted in dinner and tagged Cajun, Jambalaya, louisiana, vegan.